The country’s milk pool has hit a massive 7.5 billion litres as dairy farmers have reached their 50pc expansion target a full two years early. Dr Pat Dillon, a Teagasc dairy expert, described the scale of the expansion and investment in rural Ireland as an “unbelievable” story. He estimates around €1.6bn of investment in stainless steel processing facilities has taken place since 2014, delivering a massive boom for the economy. The figures also show that the rising milk pool from more than 18,000 farmers milking over 1.4 million cows is delivering an extra €800m into the rural economy at current milk prices. He said the dairy industry was “vital to Irish rural life”. “For young people who want to get in to agriculture, they have to see a future in farming – they’ve voted on their feet,” said Dr Dillon, who is Teagasc Moorepark’s head of animal and grassland research. The country’s cow herd produced 7.5 billion litres of the ‘white gold’ last year – a 53.5pc increase on the 4.9 billion litres that was the baseline for the ambitious FoodHarvest 2020 roadmap for the industry. Even in 2018, when massive snowfalls saw farmers unable to milk cows and struggling to cope in harsh conditions, the country’s expanding dairy herd still recorded a 4pc rise. It comes at a time when agriculture is in the spotlight, as Environment Minister Richard Bruton draws up targets to curb greenhouse gas emissions. Dr Dillon pointed out the industry was not ignoring the “pressures from the environment”, with efforts under way to ensure farmers were operating in the most carbon-efficient way possible. “The industry is very profitable for rural areas – are we going to sacrifice them for environmental issues?” he asked, adding that the level of improvements and investment to tackle environmental issues must be acknowledged. “We have a really competitive advantage and a lot of potential – and we still do have a lot of untapped potential. “That expansion didn’t come by accident, the technologies were developed over the previous 10 to 15 years,” he said. The country’s dairy processors, from the Kilkenny-based Glanbia to the west’s Aurivo, are all expecting further expansion this year. Dr Dillon said an increase of 5-6pc could be expected. 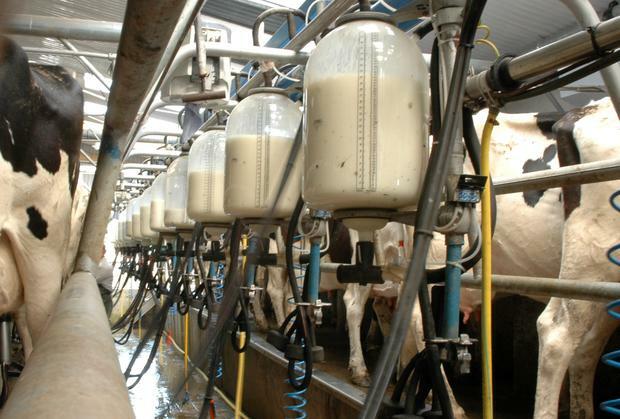 Agriculture Minister Michael Creed said there was a global market for all of the milk being produced. “What is abundantly clear is that we need to make sure that we do that in the most sustainable way – environmentally and economically,” he said. Mr Creed said the dairy industry could not absolve itself from its “responsibility” from a growing herd. He pointed out there would be sectoral “targets” that the industry would have to comply with. “They won’t be easy but neither should they fill us with fear,” he said, adding that farmers could make better breeding decisions, reduce fertiliser use and low emission slurry spreading technology, to reduce methane emissions.